First of all, I had no idea I was going to get this bad boy so soon. The store had been telling me the earliest delivery for Canada would be November, and it said this for months. When I ordered the machine it still said November. I had hovered over the pre-order button for a good couple of years before pulling the trigger on the Glowforge Basic. I am hearing stories that due to the pass-through on the Pro, Canadians cannot yet order it. Will update with more information as I get it. Fortunately, as I say in my Glowforge Pro Versus Basic post, I prefer the Glowforge Basic anyway! While I might have saved some money by taking part in the pre-order/crowd-fund, I don’t think I could have waited that long, so I am glad I bought it now. 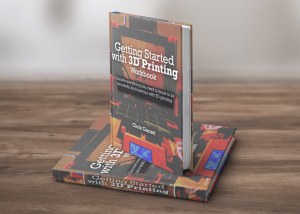 Plus, after my K40 experience, and all that time on two maker space’s laser engravers, I knew my way around a machine a little better, and knew what I was looking for in a new unit. To say I was surprised when UPS told me I had a package coming would be an understatement, but then, true enough, I got an email from Glowforge too! Anyway, I sorted all of that out by asking if they would represent me as my broker. That seemed to work out ok because the next thing was to pay $160 CAD of import duty. That is not the most I have ever paid to receive a machine but it is not a tiny amount either. Something to consider as part of your budgeting. Fortunately, by using a friends referral code I had managed to get $100 USD knocked off the price of the unit, so all good. Get up to $500 off the price of your new Glowforge by using my referral link. Yeah, I would have preferred to not pay any import duties, but they do not ship within Canada, and those are the rules. In fact, despite getting a selection of “proof grade” materials with the package, you can not as a Canadian even order any to be shipped here yet. Bummer. 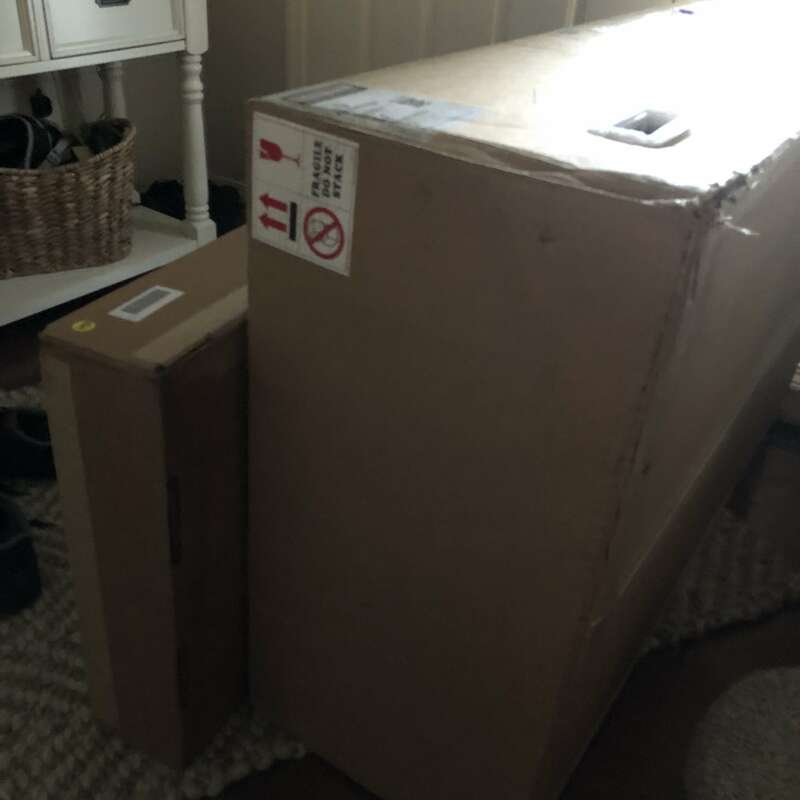 The Glowforge arrives in two boxes. In box one is the Glowforge itself. This is large and heavy enough that a wise person would get help moving it around. The UPS delivery driver left it on it’s side outside my front door, pressed the doorbell, and dashed. That is one strong lady, my hat is doffed to her. The second, smaller box, contains the crumb tray, hose, and your proof grade material selection. My guess from the low price of the Glowforge itself, is that these proof grade materials are their actual business model, rather than just from selling machines. Recurring revenue in a “give the handle away and sell the blades” kind of way. In my box I got a nice variety, nothing too outlandish or exotic (veneer, acrylic, draft board), but I did get a couple of pieces of leather, which will be interesting to try, as one of my planned experiments is to engrave on my leather phone case. The Glowforge is well packaged, with lots of foam protection and a big, sturdy box. Good job because my big sturdy box had been bashed and dinged on its journey from Glowforge to me. Fortunately for me, everything seems to be fine in operation with no serious cosmetic damage. The hardest part of the procedure was lifting the machine out of its box and onto the desk I had cleared in my garage/workshop/junk zone. Yeah, remember what I said about a wise person would get help? At that point my family had left me to go shopping and I didn’t want to wait. I managed but let’s just say in my middle age I am not as strong as I once was, especially in the lower back area. Get help with the lifting, believe me. There are a bunch of taped pieces, and a couple of red strips to remove. There are also a couple of thumb screws to take out. It’s all in a helpful step by step tutorial that I only found online after I had started the set up. The sheet of paper in the box takes you to a page that seems to jump to setting up wifi, at least for me. Perhaps because I had already logged in to the site before my Glowforge arrived? Not sure. As mentioned, my Glowforge is in my garage. My wifi JUST reaches out there, which might be why I had to restart my calibration process over using the tried and tested IT Crowd solution (“turn it off and back again”). Smooth sailing after that. The wifi set up is the usual easy connect to a wifi hotspot, set your network details, go back to your regular wifi affair. It only picked up my regular wifi and not my 5ghz, but I am pretty sure you could even get away with using your phone as a hotspot too. 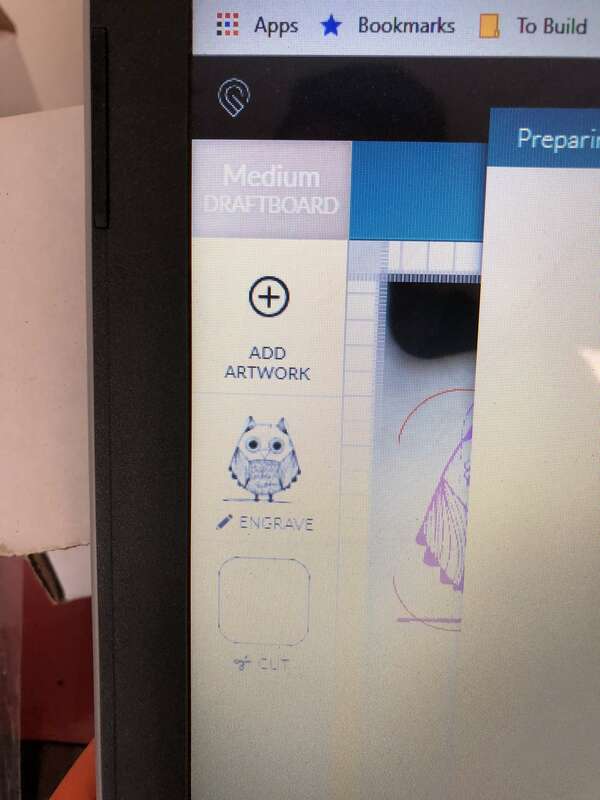 That proof grade material has a little QR code sticker attached, so material setup is done for you, though, of course, you can tweak and save settings to your own liking. I picked out a sheet of draft board, seeing as I was going to be testing. Draft seemed appropriate. It’s actually nice stuff, I will get more of it. There are a bunch of free and “to pay for” designs available, you can upload your own, and more intriguingly, use the built-in webcam camera to capture a scan of a design from whatever you can fit on the bed. My first test cut was a pre-supplied ruler keychain. Choose or upload your design. Press the glowing button on the machine. Easy! Shockingly so. It just works, unlike some very ﻿expensive laser engravers I could mention. Next, I uploaded my Maker Hacks logo. It picked out automagically which pieces were cuts and engraves, interpreting from the colors and shapes. 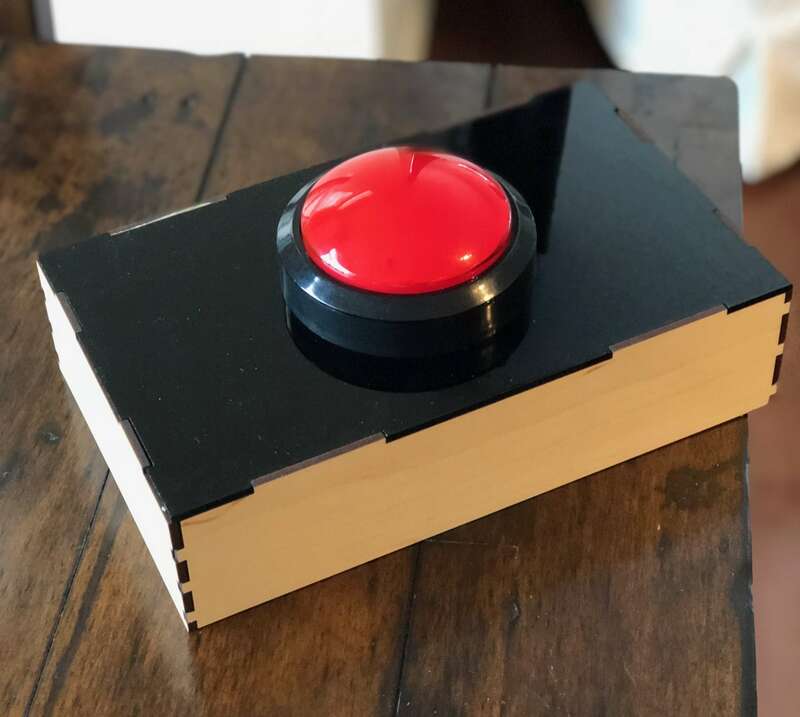 Again, hit print, press the magic button. Then I placed one of our coffee mats on the bed, scanned, dragged a svg of a simple box, set that to cut, the rest to engrave. Easy, and effective. To test a photograph I uploaded a picture of our kitten. No tweaks, just defaults, came out well. Finally, I did a quick SVG in Inkscape of some words with a border, making everything but the letters an engrave. Give it a raised lettering effect. Worked like magic. What are the Pros and Cons of the Glowforge? I have not had the laser long, so I will give my first impressions and then come back with more information as I experience more of the machine. Deal? So, all of that taken into account, what were my first impressions gleaned from using the Glowforge for a couple of day? Already from just sharing a couple of Instagrams, people are asking what I think of the machine, and more pressing, should they order a Glowforge, buy a cheaper Chinese machine, or get a more expensive USA-based branded machine? Let us first talk about what I think could be improved. It could be just my experience, but the set up process started with the wifi, rather than the unboxing and first steps. Not a big deal in the scheme of things, but it IS aimed at people who ordinarily will not have used such a machine before. I mean, they even call it a Laser Printer instead of a Laser Engraver to make it more appealing to complete newbs. Something that irritates the nerds, including me somewhat. Next, the exhaust hose is very short. As mentioned earlier, I am working in the garage and need a very long hose to go from the table the Glowforge is sat on all the way out of the garage door. I ordered another bilge pump and more hose from Amazon to resolve that. At the time of writing there is not much in the way of an ETA for their filter system that you can pay extra for. That would make things easier on location and venting … provided it works as advertised. Seems they are aiming for November or later 2018. The webcam on board is a great idea, do not mistake this as super criticism, but I think sticking to one fish eye style camera is not going to do the job. I would like to see an upgrade that uses multiple cameras or at least SOMETHING that makes the alignment more accurate. Still, it is very cool to be able to see on screen where your artwork will drop even if it is not millimeter accurate. While the image does update, sometimes it gets stuck on an old image and the option to refresh goes away. Perhaps I just don’t understand the process yet (I haven’t RTFM yet!). Means sometimes you are trying to align to an outdated reference. Speaking of alignment, there is no way to do a jog or test fire built in. This is second nature to users of other lasers. What I will try is creating an SVG of an alignment cross-mark, then if I do a verrry light pew, I should be able to get some better idea of where my burn will start. Would be really nice if they could add some basic tools in the software, crop, rotate, mirror, and repeat/array? Even better would be to allow us to use external software like LightBurn, but I doubt that will happen unless the company goes belly up. While there is a Pro model with pass-through, in fact the basic that I have does have a front-flap, but it is set to not function while the flap is open. Huh. Perhaps a safety concern – it is at kid-eye-height. I will experiment with magnets to fool the Glowforge into thinking the flap is closed if I ever need to try a longer piece. Finally, as mentioned above, in Canada we are not allowed to buy Proof Grade materials yet. This is pain, because one of the delights of the Glowforge is the end to end process. Fortunately, we can use locally sourced materials. That was quite a list! Does that all mean I do not like the machine? First of all, the machine itself looks great. Seriously, using the Glowforge reminds me of the Ultimaker in terms of style, finish, quality of parts, and assembly. I could almost believe it was designed and made by the same people. It looks good, but it also looks like it means business. Yes, it is plastic, but it doesn’t feel cheap. It’s sturdy and feels professional. My chinese laser feels like a chinese laser, especially when you look inside. Considering it is half the price of a lot of the competition, it is amazing. Yeah, it was crowd-funded, and yes it is still more expensive than my Chinese K40, even with upgrades, but it is incredible value for money. Only the pro version of the lineup is in the price range of a Full Spectrum, Trotech, or Epilog, but it is still American-made. I’ve used these more-professional priced machines and I would not say they have an edge over the Glowforge either in use or in output. Yeah, they are probably faster in operation (mainly engraves), but I have not found the Glowforge to be less precise or less capable. That’s at the pricey end, what do I get for the extra money over my k40? First, I get customer support and service. My own K40 was bought privately from someone in a Facebook group, but there isn’t even a brand name to search for to find support. They are generic, made to a price point, machines. If you buy through a reseller maybe you get support that way, I don’t know. 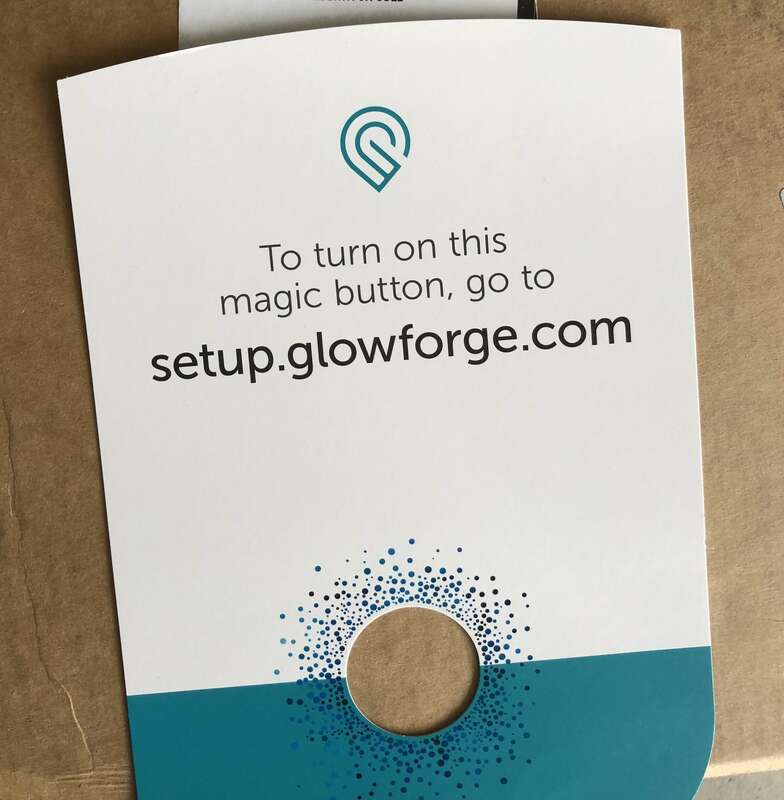 With Glowforge there is a customer service team and a warranty. In terms of specs the Glowforge is still ahead over my K40. The usable area is larger, and the machine accepts larger material, even without tricking the front flap sensors. 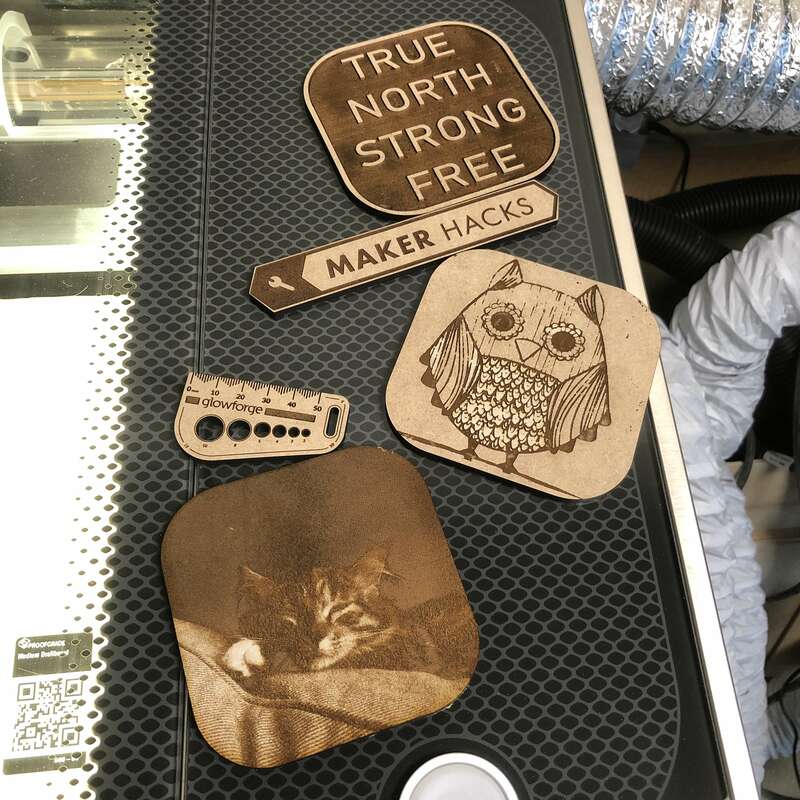 Working with the K40 is much better since I upgraded the smoke assist, the ventilation, the main board, the optics, and the software, but the K40 is still not as crisp, precise, and repeatable as the Glowforge even after all that time, money and research. 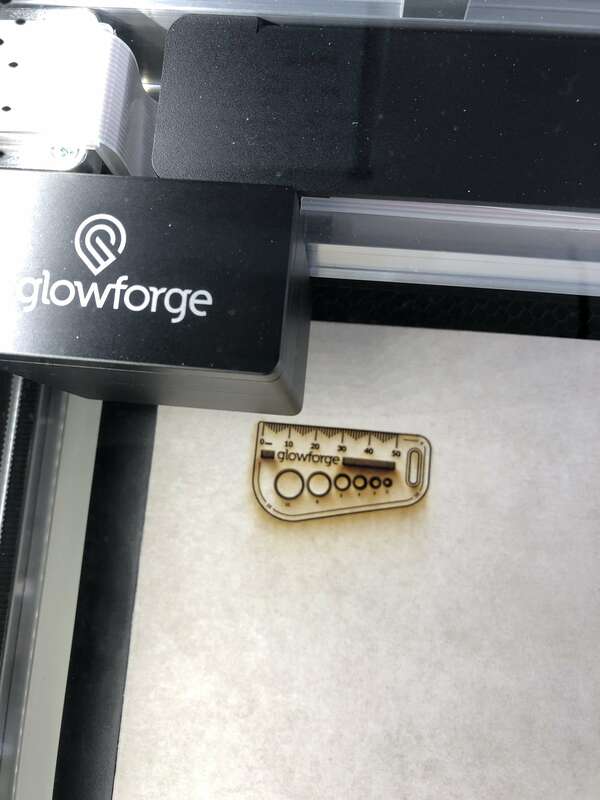 Focusing on the K40 is a pain whereas it happens automagically on the Glowforge. On both machines I would prepare my files using Inkscape or Adobe Illustrator anyway, but the Glowforge has capabilities in the cloud software already that is not possible on the K40 without an additional toolchain, such as “scan and print”. 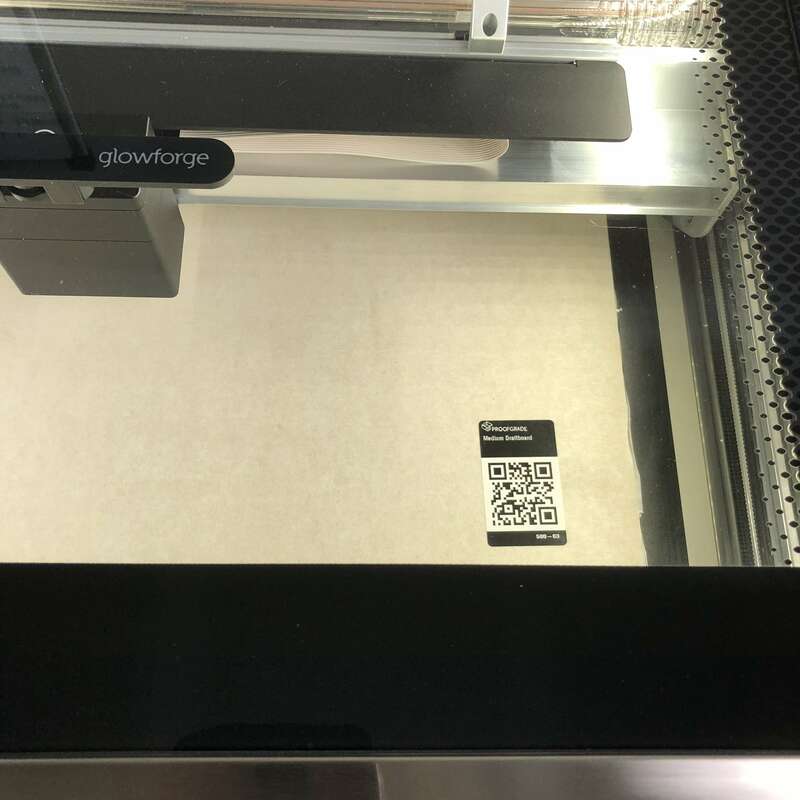 The Glowforge ecosystem is very convenient also. 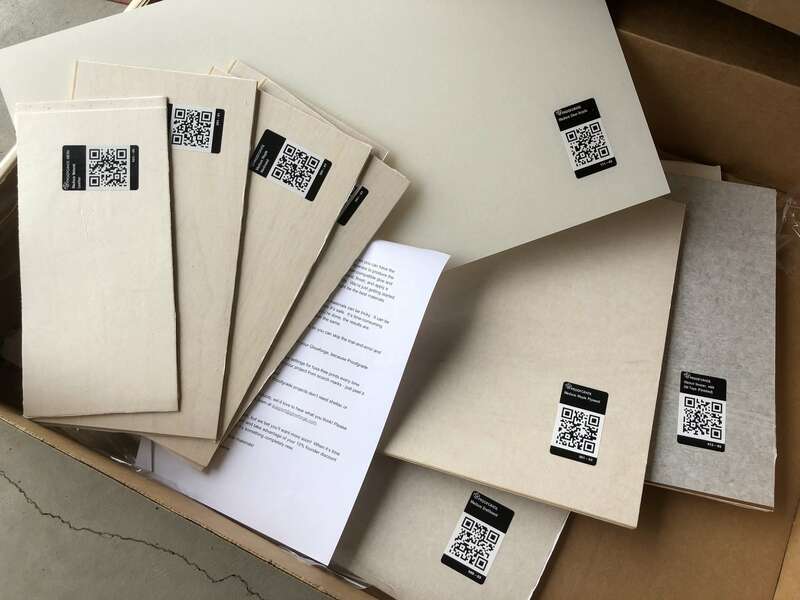 Having the QR-coded proof grade materials is such a comfort. Again, it is like with Ultimaker and their RFID filament spool system. It takes the doubt and guesswork out of settings, while not locking you in to a closed, DRM style system either. I am looking at you 3D Systems. Add to that the fact the company is still developing everything (even just in the short time I have owned my Glowforge Basic), and I can only see the experience getting better and better. It feels almost like Tesla with their over the air updates which make the machine more capable as if by magic. Of course, like Tesla, a couple of bad business decisions or an unforeseen event could brick the machine. Fortunately, the company has released firmware source code and made promises that customers will never be left high and dry. Let’s hope we never have to go there. The company is only one side of the equation. Glowforge has also attracted a vibrant, supportive community. That also speaks volumes. There is a growing Facebook community, the official forums, and more YouTube videos being added all the time. Even Instagram has more and more shared images appearing. One of the reasons I would guess is the Glowforge is a known brand and a known quantity. While I talk about owning a K40 laser, mine is almost certainly different to yours. I can’t for sure give you advice about your Chinese laser without offering caveats and hedging. Price would be the other reason. 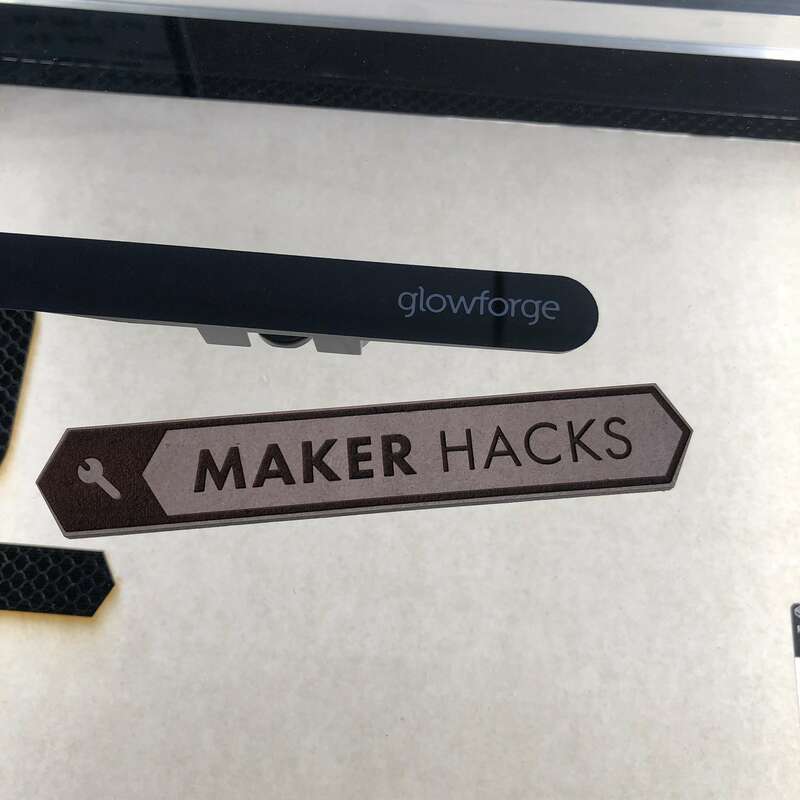 You can get up and running with your Glowforge for less than a Muse, Trotec, Epilog, or even a Dremel, and none of those have the warm and fuzzy approachability that Glowforge has. It is funny how the big name players speak to ease of use, but the Trotec at our community-managed maker space is always down for maintenance. It’s very, very easy seemingly to bork the tool chain or settings. 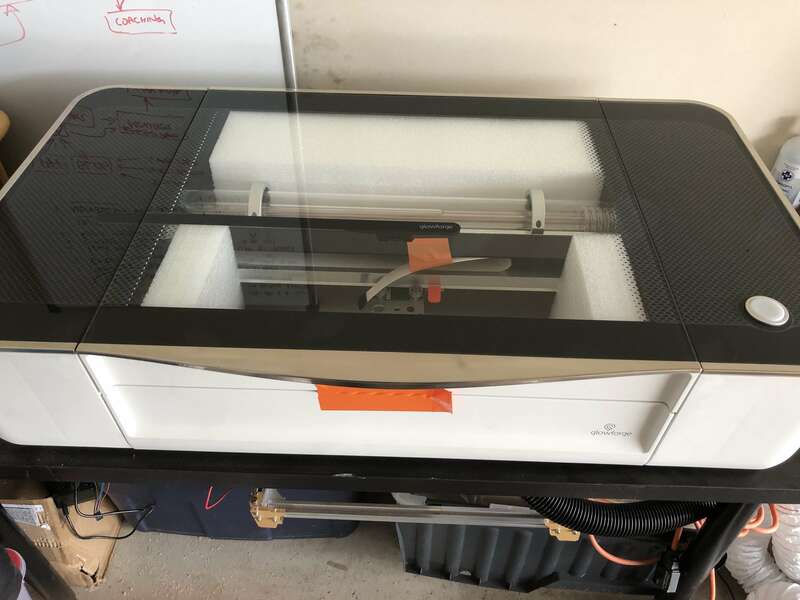 I bought the Glowforge Basic, which is $2,500 USD or $116/mo. There is also the Glowforge Pro at $5,995 which has the pass-through slot. The middle guy is the Glowforge Plus, which is $3,995. Personally I would go with the Basic or the Pro. This is larger than my K40 and probably as much as I ever needed on the much larger lasers at the two maker spaces I am a member of. Remember also, even my Glowforge Basic came with a crumb tray and a front flap. The laser tube is a CO2 glass laser tube capable of continuous operation at 10,600 nm; rated at 40 watts. My K40 is sold as a 45w but most users agree that is only a theoretical value, with actual reality being more in the 35w range as new. With the Glowforge having autofocus and less of a fiddly mirror alignment challenge, plus not having to shim material to focus height, or upgrade to a moving Z bed, you also get more of that laser juice hitting your material than the fuzzy almost focused beam I would manage with my K40. Focusing or being out of focus is probably the most frustrating part of owning a cheap laser, so this is a joy. It just works. Heck, the expensive ones usually need manual focusing too! One of the things that amazes me is the positioning precision and laser resolution (theoretically up to 1355 DPI). Yeah, if you use that full resolution it is going to be tediously slow, but that resolution beats actual desktop laser printers. This is an engraver! A CNC machine! I’m pretty sure the output is at least on a par with the Trotec laser, but, what, 1/5 the price? Cooling is not ideal. It does have liquid cooling but seems to just cycle the water rather than refrigerate it, with no way to add that yourself. 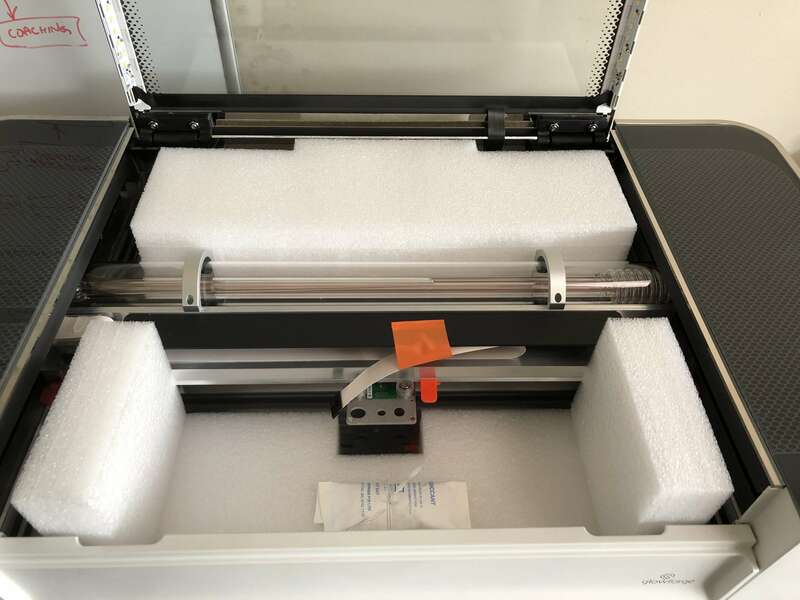 I bought an expensive refrigerated unit for the K40 which I would love to use in summer on the Glowforge. Most people point an AC unit at the machine instead. The air assist seems very effective versus the (not inexpensive) airbrush compressor solution I installed on my K40. Here it seems to be simply a powerful 12v DC fan blower, but I will double check on that next time I take the laser head out for cleaning. There is also of course an extraction fan, located at the far left of the machine. 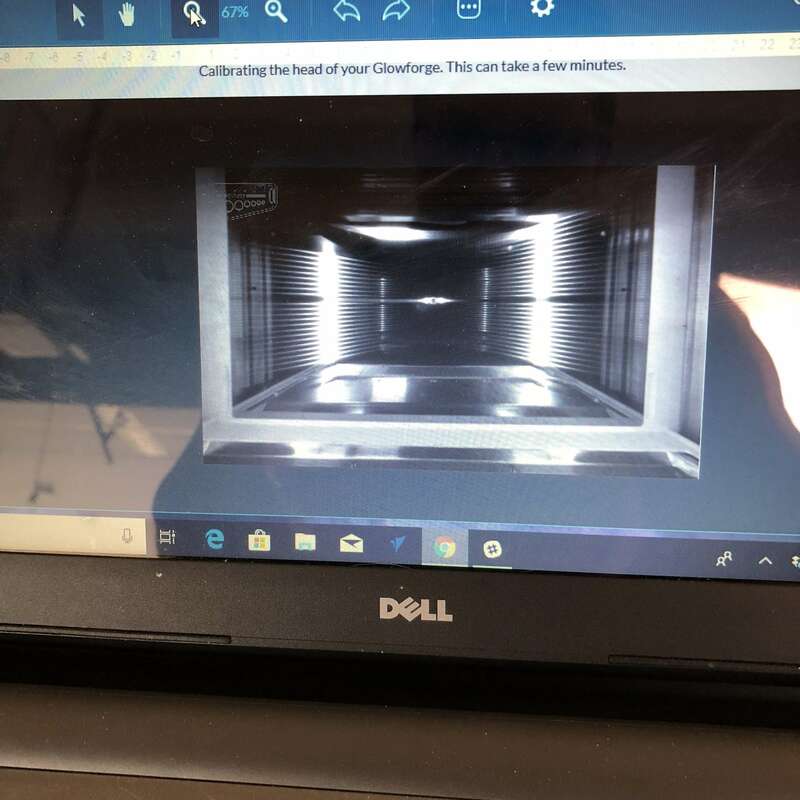 That does a good job removing smoke and particles from the work area as it cuts and engraves, though some people have expressed concern that it essentially draws the smoke across some sensitive components. Other people have mentioned how inaccessible it is for thorough cleaning. These things can be a magnet for hair and dust, which reduce the effectiveness of the fan, building up more grime and dirt into the system. We have to remember this is all version one, or even beta, because while the pre-order period was literally years (and made a heck of a lot of money, to be fair), the machine has not even been in many people’s hands for a year. The first we heard about machines in the wild were test units at places such as Adam Savage’s Tested.com rather than regular users or even print shops. As of right now I have set the machine up, used it for a few hours on some draft board test cuts, and had a whole bunch of fun. That’s only really testing that I got it set up successfully, and I haven’t even read the tutorials or documentation. While this shows it is pretty hecking easy to use, it also means I haven’t stretched it. I did one serious project for work, you can read about that Glowforge project here. Next up, I need to use more of the proof grade materials, such as leather, veneer and more acrylic. Then I need to use NON proof grade materials, especially materials not as premium quality, to see how the settings and focusing cope. My guess is the cuts on the proof grade are going to be better because they will have better tolerances and quality control, the materials are a known, consistent quality for the settings to be on point, and the 3M sticky transfer sheet coating prevents flare ups that would ordinarily happen at high power and low speeds that will be necesary to get through the thick glue, knots, and imperfections in locally sourced plywood, plastic and MDF. Of course I need to also have fun with some pretty random items. Maybe I should try engraving a laptop or phone case, as mentioned before. Something curved, maybe a glass bottle. I also need to create some more complex friction fit CAD designs, as well as something much more complex in Adobe Illustrator. I did one photo engrave, which came out pretty nice considering it was all defaults, but I need to try a mixed vector and bitmap SVG, and to put the 3D engraves to the test with a graduated grey scale engrave too. There is lots still to try before I can give a total verdict, but so far so very, very good. If you are considering buying a laser engraver, the Glowforge is well worth at least having on your short list. 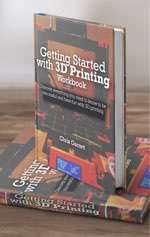 « Are You Making Soldering More Difficult than Necessary?